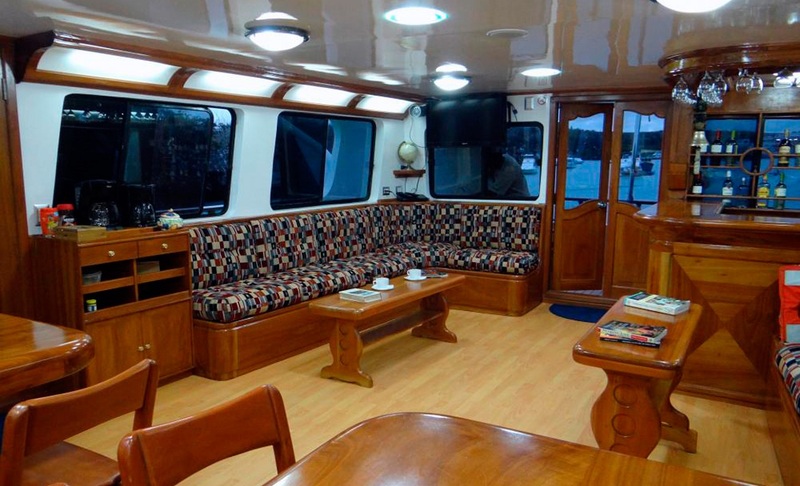 This beautiful motor yacht offers a cosy and pleasant small group atmosphere for a maximum 16 passengers, with the highest standards in safety and service. 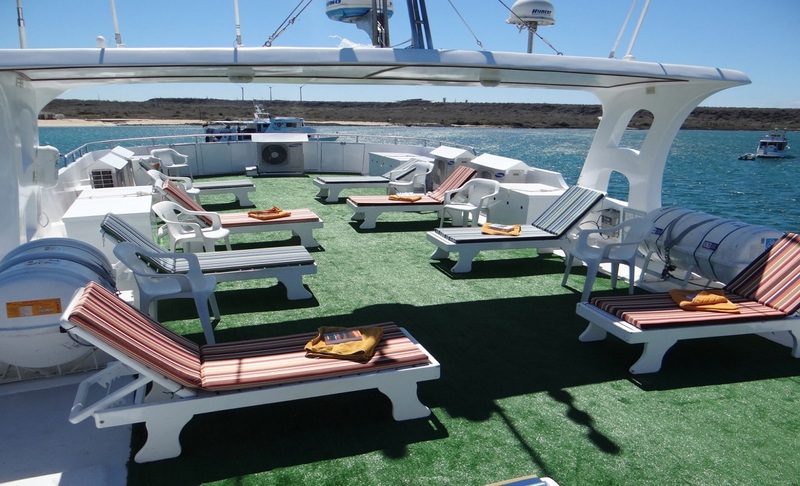 Explore the central islands around Santa Cruz and venture south to fabulous Española on this 4 day Galapagos cruise filled with enchanting wildlife and spectacular scenery. 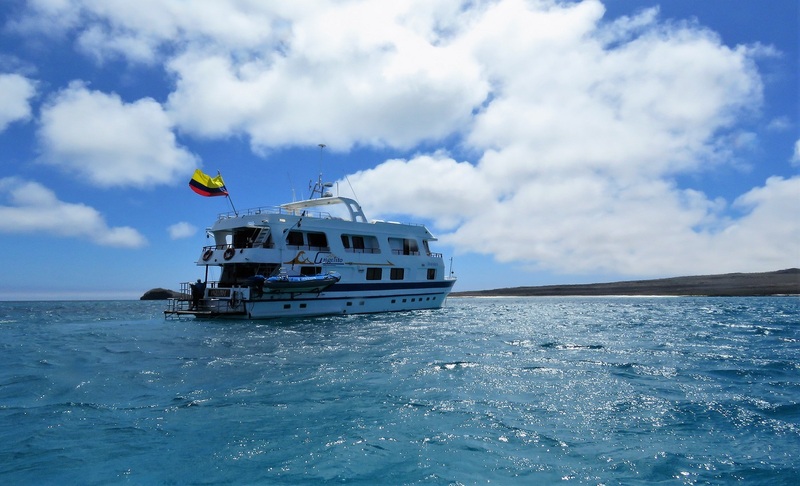 Today you will board a flight from mainland Ecuador and travel to the island of Baltra in the Galapagos Islands. 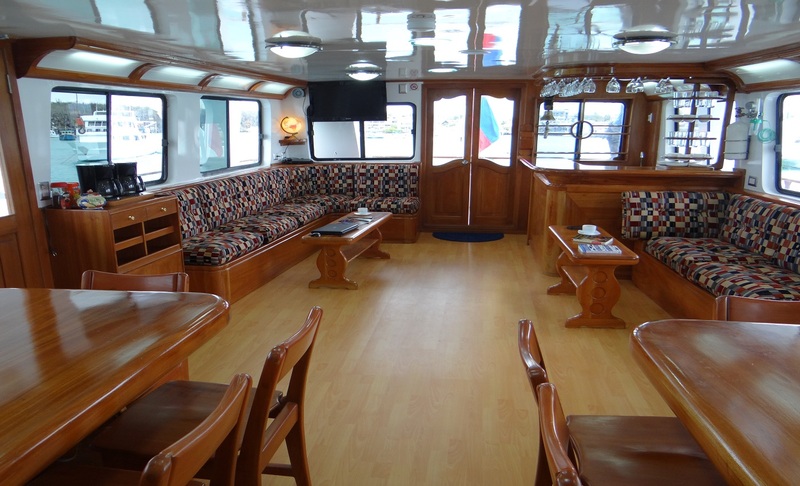 This flight from Guayaquil to Galapagos will take about 90 minutes. Arriving at the airport, visitors will first have to pay the entrance fee of US$ 100 for the National park. You will drive up to the highlands by bus. 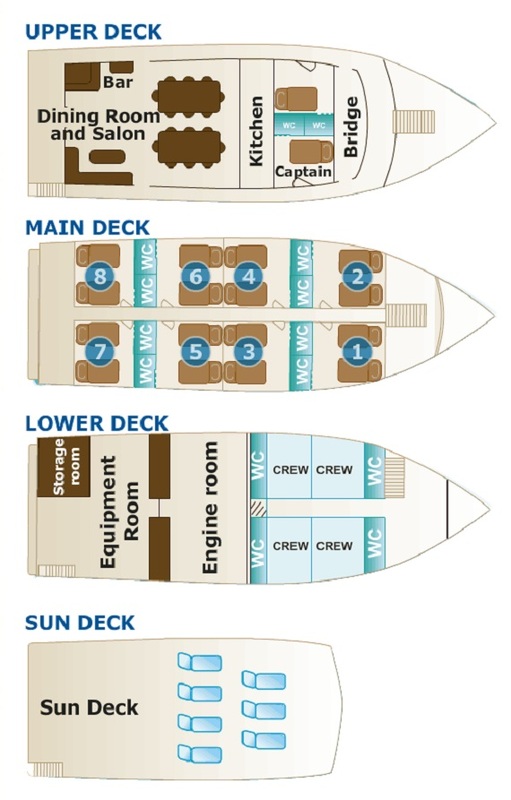 As you are travelling along you will begin to notice the transition between the different vegetation zones from the Arid zone to the Scalesia zone, where the problem of introduced animals and plants becomes obvious. 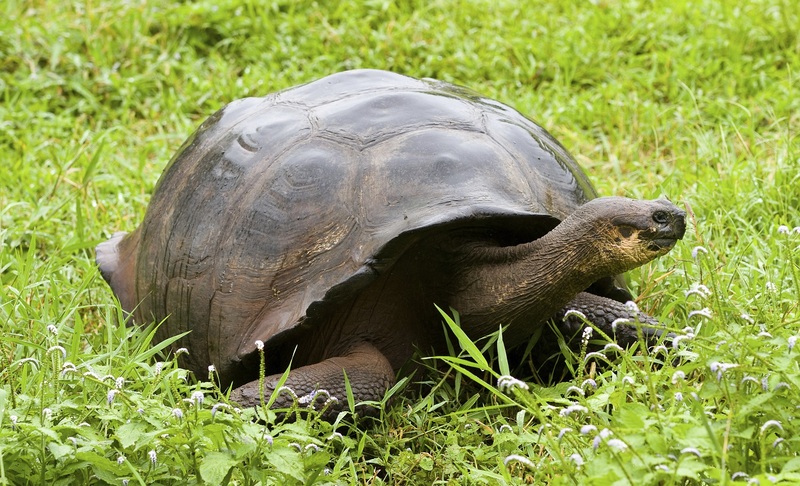 While in the highlands you will visit a farm in search of the Galapagos Tortoise, roaming around freely. During their migration period they will spend part of the year in these highlands where can be easily observed. Your day will start off with a visit to Playa Gardner, a wonderful long, white beach made of coral sand. This visit doesn't require any shoes. This is a good place to observe the finches and mockingbirds in the salt bush vegetation. 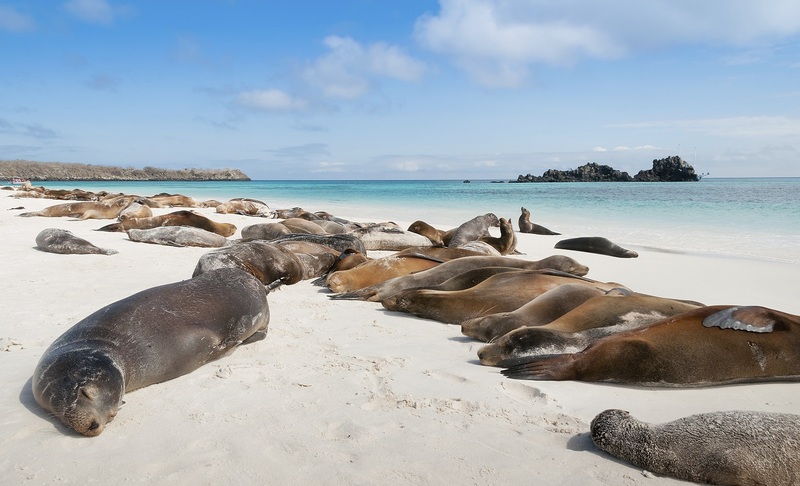 You will have the opportunity to swim and snorkel off the beach here and get up close to some Galapagos seal lions. Loop trail with an easy, dry landing on a jetty. 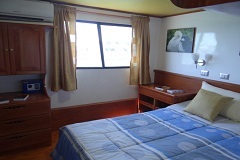 You will embark on a walk around Punta Suarez which is quite long and difficult. 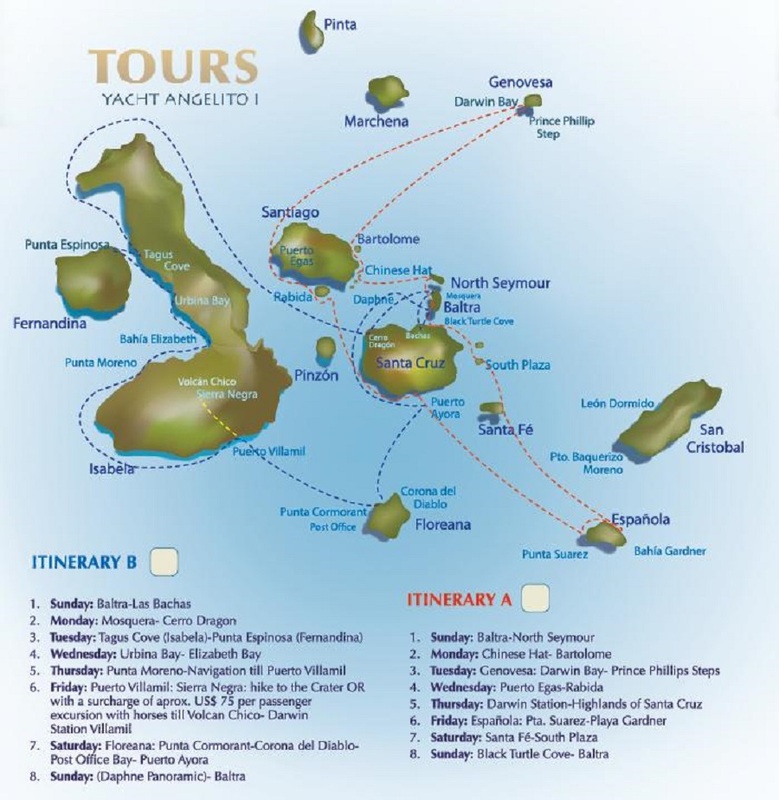 From the very beginning of the trail you will see the "Espanola marine iguana" and Galapagos sea lions. This trail leads through the nesting colonies of blue-footed boobies, Nazca boobies and waved albatross. Along the trail you will come to rest atop a cliff and be given the opportunity to watch all the different marine birds flying along the coast. You will have another stop by the blowhole where the seawater is pushed through a fissure in the cliff into the air which can sometimes reach 80 feet high depending on the waves and tide level. 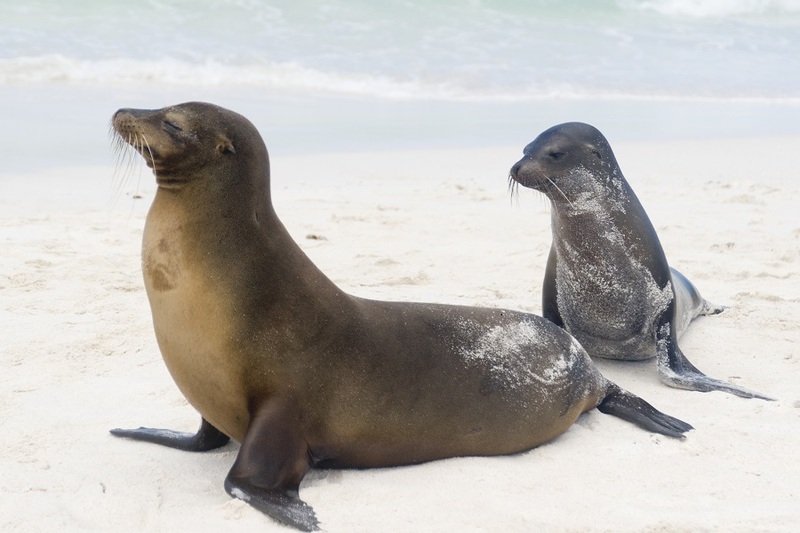 The short trail leads from the sea lion colony on the beach through dry vegetation of the Arid Zone to a wonderful forested cliff with high prickly pear cactus and then back to a second beach. Only the very attentive visitors can detect up there the endemic land iguana of Santa Fe, because he is perfectly camouflaged in the same colors of the vegetation and their territories are quite big. 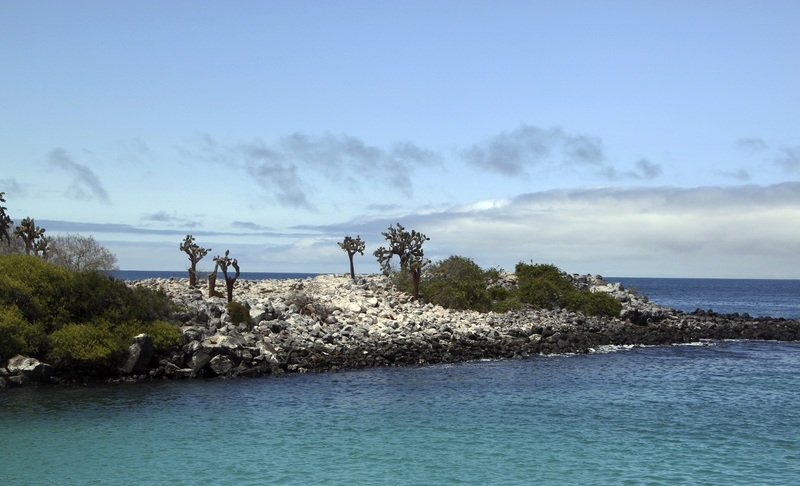 South Plaza is a small uplifted island with a cliff 25 meters high on the southern side of the island. 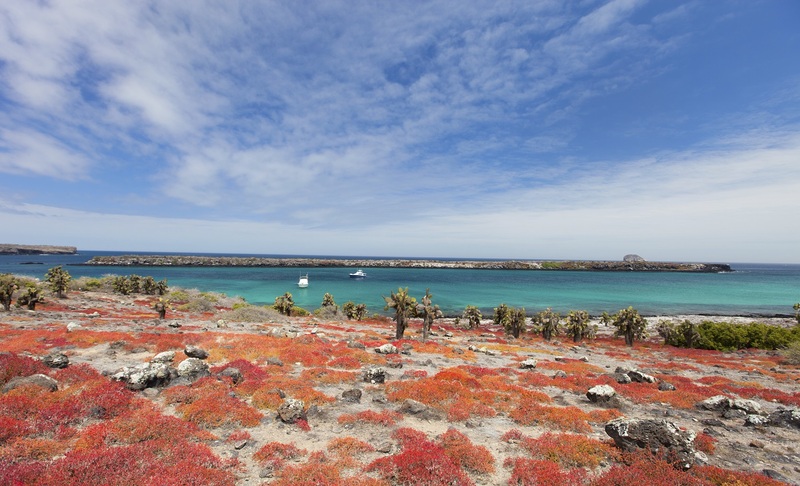 The whole flat, rocky northern coast has a big colony of Galapagos sea lions and on the East point is a bachelor sea lion colony.Very attractive are the beautiful prickly pear cactus trees and of course the big colony of land iguanas. 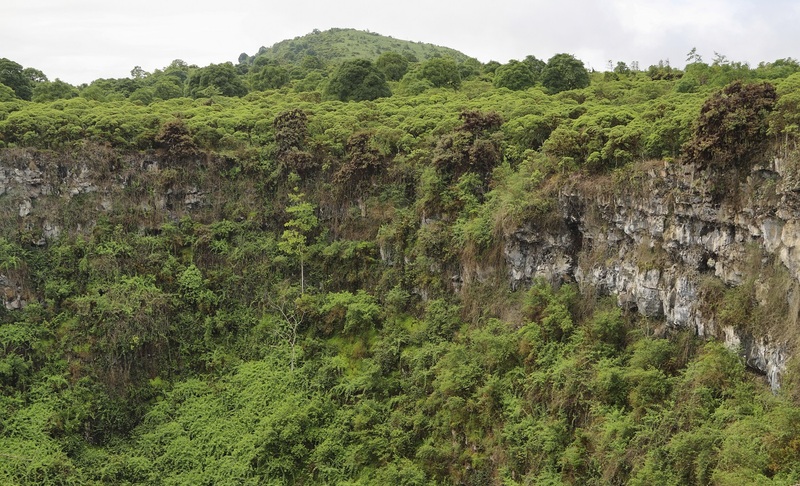 Depending on the season, the sesuvium ground vegetation changes its colour from intense green in the rainy season to orange and purple in the dry season. With the dinghy we go into the big protected mangrove cove. 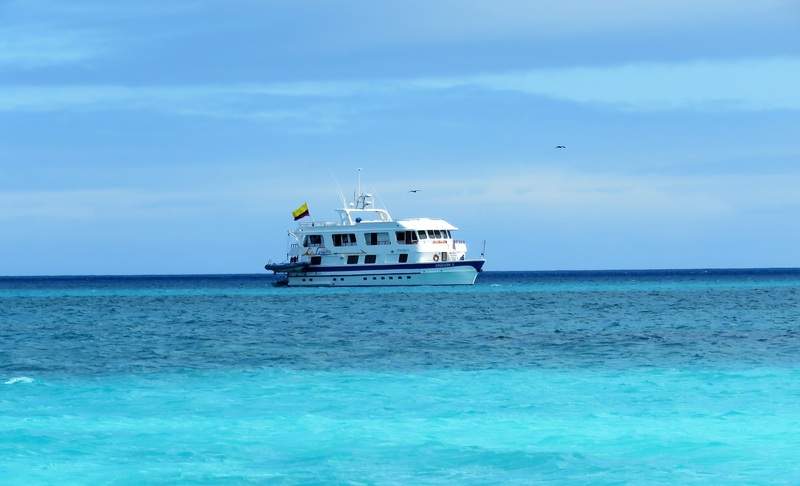 In the far away small corners we turn off the motor of the dinghy and noiselessly observe the marine turtles. There are a lot of them in the cove during mating and nesting season (December to February), but even out of season there are always some turtles staying back in the mangrove cove to rest. 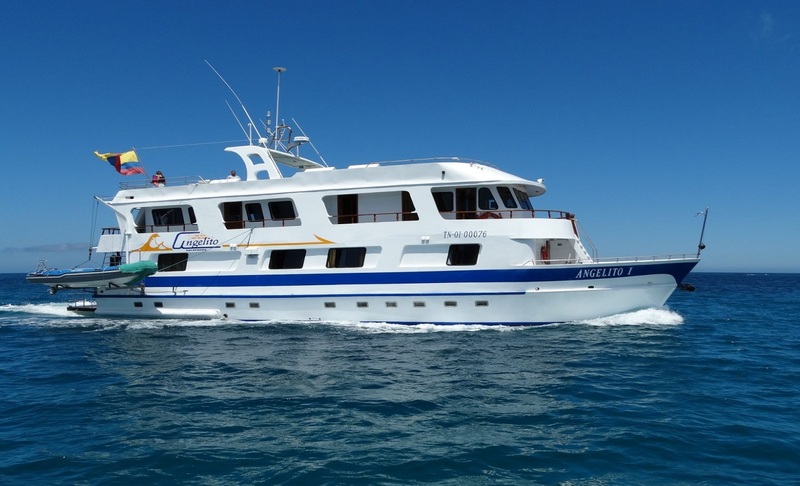 Spotted eagle rays, golden rays, white-tipped reef sharks and young Galapagos sharks can often be spotted. 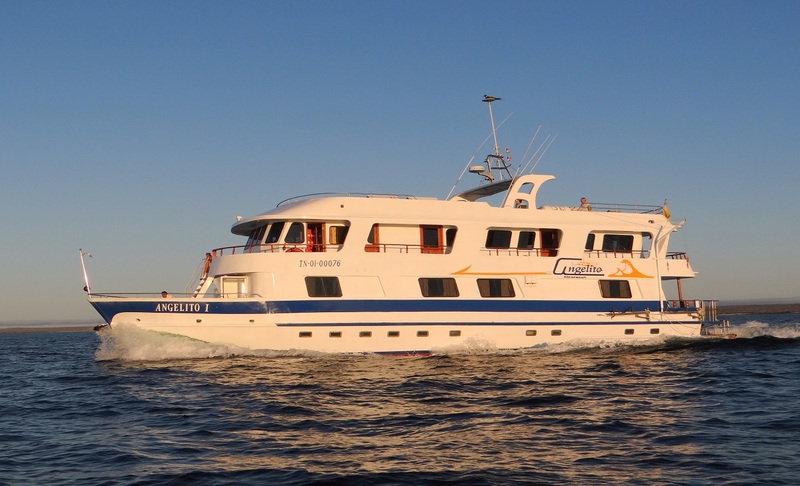 At the end of the cruise, the passengers leave the Angelito again in the harbor of Baltra and your guide takes care of everything until you fly back to the mainland.